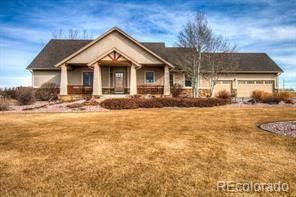 Custom built ranch w/walkout bsmnt on 2.8 acres and 30x40 detached shop. Situated 10min North of FTC on paved roads, enjoy peaceful setting and amazing views. 100% main-floor living w/open floor plan and 10ft ceilings. LR fireplace w/stone, cherry wood floors, gourmet kitchen w/granite, lrg trex deck w/pergola. Bsmnt features 9ft ceilings, wet bar, media room. Meticulously landscaped w/9 garden beds, firepit, many trees, irrigation, flagstone walkways and patio. NEW ROOF ON HOUSE AND SHOP Sept 2018!